It has been quite a while since our last update; we have travelled from the rainy Pacific side of the Patagonian Andes to the dry, flat and vast Atlantic side of Patagonia. The contrast has been stunning, and the landscape beautiful. Water has been scarce, and the winds have been stronger than any we have experienced, which have combined to make some challenging riding. But, the skies are amazing, the wildlife is abundant, and when the wind is at our backs....well, nothing compares! We took a day off in Coyhaique, as there was quite a lot of rain forecasted...but, of course it didn't rain at all! But, that was Ok, we were in need of a rest. From Coyhaique, the road climbed slowly through farmlands, and then into dense forests. We were heading towards the highest point of the carretera austral, but at a mere 1100 meters above sea level it didn't seem like much to boast about. As we climbed there were many signs to be on the lookout for Huemules, a type of deer. However, we only spotted one hiding in the forest. We stopped to camp across the lake from the paid campground, and hide our tent in the woods. We had more rain in the evening and throughout the night....making us thankful for all of our waterproof stuff! The next morning it was still raining, but we packed up and carried on. We just had a couple of km to the pass, then the road dropped and rose again. Finally we reached a long descent...but the rain and winds picked up with ferocity, making it a very very cold and wet 20 km descent! We had decided to take a detour from our route to visit the Cerro Castillo National Park, and do some hiking. So, we turned off and headed 10 km downhill to the village of Cerro Castillo. There was not a whole lot there, but we were lucky to find a free camping spot right on the rivers edge. A mangy dog kept us company by working his way closer and closer...he wanted to cuddle (and eat our food) but he was a little too gross for that! In the morning we set off for a hike! We left all of our stuff at the free campsite ...hoping that no one would be interested in stealing it, and pedalled 5 km down a gravel road to the trailhead. The plan was to hike up to a lookout where we would be able to see the glacial laguna beneath Cerro Castillo. The translation is 'castle hill', and it is called this because of its many rocky spires. We hiked and hiked up and up. Finally mid afternoon, we got to what we thought was the top, but met two other hikers coming down that told us it was a lot further, up loose gravel and big boulders. We started scrambling, there was no trail anymore, just occasional small red markers scattered around. We carried on for some time and the wind got stronger and stronger...and the clouds were moving in....and the snow was moving in. We felt that we were almost there, so we just kept going and going. Then, when a gust of wind nearly knocked me over, we decided that it would be prudent to turn back... Probably most experienced mountain climbers would do that. It was a little disappointing that we didn't see the top, but a nice hike just the same. We made our way down, trying not the slip and fall...and sometimes succeeding. However, just as we were nearing the bottom Glenn slipped and landed on his hand. I rushed down and his finger was completely bent sideways! We thought it was broken, and Glenn said "should I just pull it back into place? ", I said "no! We have to get to the road , and get to the nearest health clinic!" ....but just as I was saying this, Glenn pops it back. We went to an icy creek and Glenn kept his hand there for a while.... When we got to the road, a pickup happened to be pulling out so we asked the for a ride to our campsite, and they kindly agreed...which saved Glenn's finger the agitation of a shaky handlebar along a bumpy gravel road. We ended up taking the next day off, so that Glenn's finger could heal a little and our bodies could rest after the hike. No matter how fit we may think we are from all this biking, a long day of hiking inevitably leaves us incredibly sore! Our bodies were still quite sore when we pushed off from Cerro Castillo, but luckily biking didn't hurt...just getting off the bike! We retraced our tire tracks 10 km back uphill, and then took the turnoff for Puerto Ibanez. We still had an incredible view of the mountain all day long! We also were treated to some intensely strong tailwinds. So strong that there were times we didn't even need to pedal uphill! This got a little scary when we started descending into the town and the road switched back, meaning the wind was sometimes at our side or in our face....but, this was just the beginning of the monster winds! We arrived early afternoon, and we were planning on taking the ferry across Lago Buenos Aires that evening. We decided to make some dinner before the boat ride, and found a somewhat sheltered spot.. Then we headed to the dock, only to find out the ferry was sold out...we would have to wait until tomorrow. We pedalled through town looking for a place to stay, we were in desperate need of a shower (it had been nearly a week...), so we settled on a little room and got to bed early. We were sleeping soundly and then around 12:00 at night super loud music started! I went to find out what was going on, and found that the hostel was attached to a 'disco'.... Inside I found an empty room with a lone bar tender. She told me that the music would be on until 5:00 am.... This was not good. Luckily the hostel owners also owned the disco, and they were apologetic that no one had told us that there would be a disco that night. They said that we could go to a different hostel, and they wouldn't charge us, but at midnight with all of our stuff unpacked....it was not a good option. But, they also had a little cabana, a short distance from the hostel...so thankfully they let us sleep in there! The next day at noon we got our ferry to Chile Chico. It was a lovely ride, on turquoise waters. We decided to head into Argentina and the town of Los Antiguos that night, as it was only a short distance. The scenery had become much flatter and drier, and the winds were strong. But, we made it to Los Antiguos in a short time, and decided to stay at the municipal campground...which meant showers two days in a row! Yipee! Fully loaded with food and water we set out from Perito Moreno, with a little apprehension. The lovely tailwind that we had experienced the day before would be a fierce crosswind if it was the same as yesterday. But, we were lucky the wind was light and mostly at our backs. We also saw so much wildlife, Guanacos, Armadillos, Nandus (rheas), Rabbits, and Foxes. It seemed strange that such a stark landscape had so much wildlife! We passed through a colourful canyon, and the wind seemed to disappear entirely. Taken advantage of the calm weather we pushed on and ended the day at an Estancia, where a small campground was set up... Which meant...more showers! We only had about 50 km to the next settlement of Bajo Caracoles, so we took our time in the morning and then took a short cut back to the road (which turned out not to be a short cut, because we missed the spot to cut through the fence). The wind was at our backs, and then we turned a corner and had a fierce headwind, and a dead straight road for as far as we could see. It was very slow going, inching along. We pulled our bikes down to a culvert, and ate lunch inside of it. The wind did not let up, so we carried onwards. Stopping wasn't really an option as we did not have much water. After what felt like an eternity the road turned and climbed, then we dropped into a valley and the wind almost disappeared. This made the remainder of our ride to Bajo Caracoles much more pleasant! There is not much in the town, we had hoped to stock up for the next few days, and there was a hotel/store/restaurant/gas station, but everything was very expensive and they had no produce or bread. We got the bare minimum and asked at the health centre if we could camp, and they kindly agreed. It was 230 km further to the next town, with good winds we could make it in two days, with bad winds up to four... So we were prepared for the worst. We set off filled up on water, as there is nowhere to get water for the first 100 + km. The winds were calm to start, but picked up into a side wind as the day progressed. There was an estancia marked on our map, so we were pushing to get there hoping that we could camp and get water there. When we got to the gate, it was locked and it looked like the estancia was at least 3 km down a dirt road anyways. We had enough water, so we found a culvert and camped beside it. We carried on the next morning and came to a turn in the road, thankfully the wind was now at our backs...but there wasn't much of it. We stopped at the first place to get anything, a hotel / restaurant called Las Horquetas...literally in the middle of nowhere. The fellow was not particularly friendly, but we bought some muffins and we asked about filling up our water bottles. He was very reluctant, but eventually agreed and took us out back to a tank. He told us that it was potable, but a few km down the road when we tasted it we found it to be really smokey. Fortunately there was a road work camp just 15 km along, and the friendly worker let us fill up all our jugs and bottles and eat our lunch under a shade tree. It was getting surprisingly hot as well, and the wind had died down to nothing. We carried on, and eventually came to a river (that had water! ), and we found a place under a tree to camp, and hide from the sun. The next day was again very calm and very hot, we arrived in the town of Gobernador Gregores early afternoon... It felt like an oasis.... Water in the taps, grocery stores, and the best part ... A free municipal campground. We ended up spending two full days there, not intentionally. When I was cleaning my bike the evening before we were going to leave, I noticed that my back rim was really worn. Basically, I brake a lot, and the brakes had worn a concave groove into rim. With over 1000 km of riding left ... I was a little worried that it might crack. Around 8pm, I took it down to the bike shop to get his opinion. Mario, the owner, did not have any rims my size but said that his mechanic could switch the back with the front, so that there would be less weight and pressure on the failing rim. He told me they could even do it that night! I went back at 11:00 pm, and they were still working away... So I hung out with them.... The hours passed and around 1:30 am it was finally finished, and Glenn showed up! He had fallen asleep, and when he woke up he got worried and pedalled down. It was a huge act of generosity on Mario and Jorge's (the mechanic) parts, as they absolutely refused to take any money for their work. It is this sort of kindness that we will never forget, and we will forever be trying to pay forward. Needless to say, we did not leave the next day, and instead slept in. We spent the day relaxing, and another cyclist showed up along with a friendly German couple in an RV. We had another 200 km stretch to the next town. Luckily this one went fast, with the help of some excellent tailwinds! The first day we covered 120 km in less than 4.5 hours...unheard of on a loaded bike! We were again loaded up on water but the riding was easy so we did not notice. About 30 km along, the Germans in their RV pulled alongside handing us a bottle of pure maple syrup from Ontario! Their Canadian friends had given it to them, but I guess they don't like it.... We were thrilled to take it off their hands! We found a nice place to camp near an estancia in some trees, and luckily we had plenty of water to last us all the way to the next town. The wind was not quite as perfect the next day, but it was pretty good. We arrived in the town of Piedra Buena, and stopped at the gas station to use the Internet and fill up our fuel bottle. It was a bit of culture shock, an American style giant station...with a lot of humans in it...so many people! We we into the much calmer town and found a campground and the grocery store... Where we had to stock up for almost a week! We made pancakes with maple syrup the morning we left Piedra Buena, so good! We only had 35 km to the entrance of Monte Leon National Park, but mostly uphill. The wind was not bad, so by midday we were at the Park office. We were hoping to camp there, but they said no...but that we could camp 6 km down the road near the park gate. But, there was no water there. The rangers did kindly fill up all of our jugs and take them to the gate for us, as they were headed that way anyways. Unfortunately, the water that they said was drinkable was very salinated in taste, so it was only good for cooking or washing. We camped next to an embankment near the gate. The next morning we decided that we needed more drinking water, there was a gate for a hotel across the road, but we weren't sure how far it was down the road. Glenn kindly took a big jug and headed down the road. It turned out that it was 4.5 km to the hotel, so Glenn had to bike 9 km on the gravel road to fetch us some drinking water. Then we headed down the very rough gravel road to the park ....and the Atlantic Ocean coast! It was slow going, but all downhill on the way in. After about 16 km we reached the trail to the Penguin colony. The beach has over 60,000 pairs of Magellanic Penguins. We must have only seen a fraction of these as many were at sea fishing, but still it seemed that there were thousands on the beach...quite stunning! The beach also has seal lions and pumas, but we didn't see any...only puma tracks! We then dragged ourselves up the gravel road, and were pleased to find that our tent and items that we had left on the side of the road were still intact! The next morning we woke up at five am, and were on the road at first light...and the wind was blowing at our backs! Yipee! We got 40 km in before 9:00 am, and finally made it to an estancia where a kind farmer filled our jugs again! By early afternoon, our tailwind turned into a strong sidewind. But, we had already done 90 km so we called it a day when we reached a river / wetland area with a good spot to camp. We woke up to a headwind, darn it! But, not too strong. We went through our normal morning routine, pushed our bikes up to the road and my front tire was flat! It had also started raining, so it was a very cold and wet patching session...and finally we were off. The riding was tough, but we had to make it to the next settlement of Guer Aike, some 60 km away, because, as always.... We needed water. We just sort of put our heads down and pushed along, counting the km. Around noon a car stopped in front of us and handed us a big sandwich! So nice, but sadly it was tuna... We we able to sort of eat around it though. We finally made it to Guer Aike, and found there was actually a campground. However, it was quite expensive and all the sites were muddy from the rain. We decided to just look for a free spot, and ended up camping in the back yard of a very nice old woman. The next morning it was frigid. 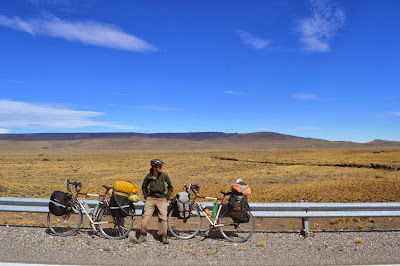 The wind was fierce, and we had on just about all our cloths, luckily it was only 30 km more to the city of Rio Gallegos, were we would take a much needed break. We covered the distance in not much time, and eventually found a campground on the edge of town. We are spending two days here, washing cloths, updating the site, resting...and enjoying access to a grocery store and water! Amazingly, we only have 600 km before we reach the city of Ushuaia, and the end of this journey. We haven't quite wrapped our heads around this yet... But, it is very very close.